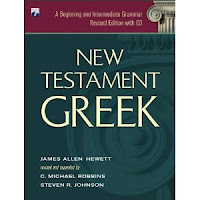 At some point in the next couple of weeks or so, I hope to post a review of a recent book I received from Baker titled New Testament Greek: A Beginning and Intermediate Grammar. 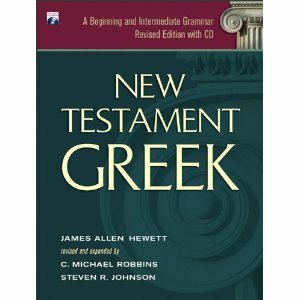 The volume is co-written by James A. Hewett, C. Michael Robbins, and Steven R. Johnson. I really like the clean feel of the book, and am eager to check out the CD that accompanies it. For now, however, I'm going to be working through the book and taking some notes. I would like to say "Thank you!" to Baker for the complimentary book. You can pick up your copy at the Baker site HERE, or at Amazon HERE.